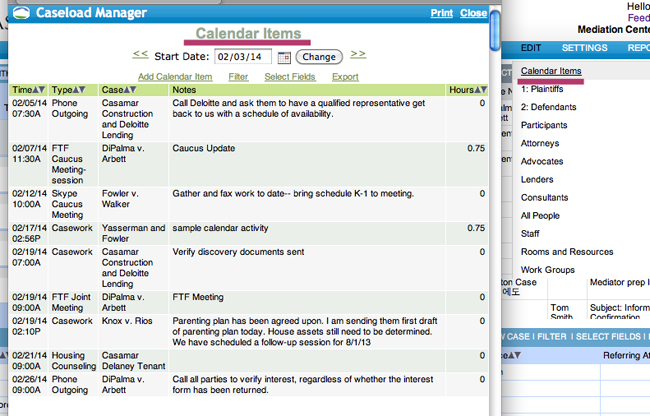 The Edit Menu allows you to edit your Calendar, Participants, Staff, Rooms & Resources, and Workgroups (modular add-on). Calendar: Your first option is to edit your Calendar Items. By selecting this, you will get a pop-up window with a list of calendar items. Note that the Start Date can be changed. To change any of these items, simply Double-Click on an item. Another pop-up window will appear allowing you to edit your calendar item. 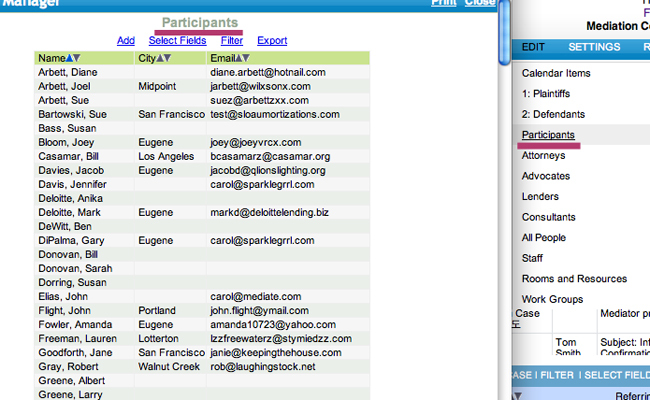 Participants: By clicking on Participants, a window will pop-up listing all of the participants involved in all of your cases. This is a quick, easy way to update a client's information, remember which case they are associated with, or look-up their phone number. You can choose to look at all people in one way, or break this window down into participatns, attorneys, and your other created party types. Staff : When you select EDIT > Staff, a window will pop-up showing you the current list of staff. It is simple to ADD new staff or a to select a new room by clicking on the ADD button in the upper-left. It is also to handy to print out a page of all of the staff and room available, along with their title, their email, and their access by clicking the PRINT button in the upper-right. When you are editing the staff, you can also include notes about each staff member. You can indicate their areas of specialty, notes of interest, language abilities, and their schedule of availability. You can see a quick list of all staff members. Rooms: You may add rooms and resources, as well as add any notes, and book these rooms on the calendar. You may click on an individual staff member for more information. 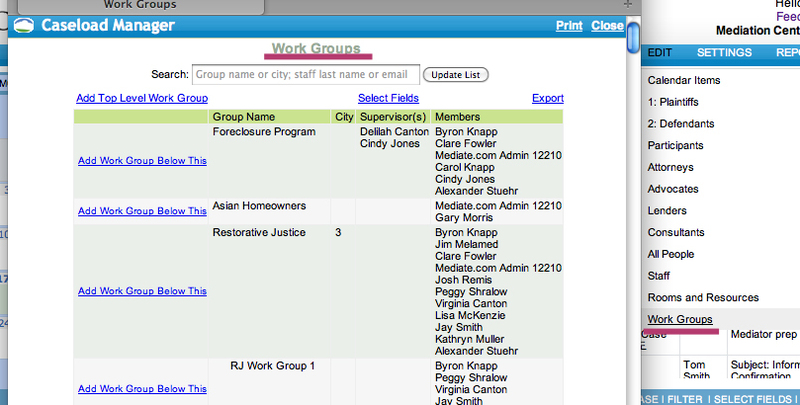 Workgroups: Workgroups are an advanced admin feature. Please send a request if you would like workgroups enabled for your office. They can be created and edited in the Edit menu.